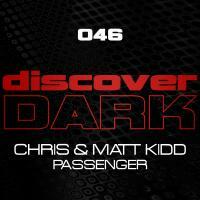 Chris and Matt Kidd return with a vengeance with this Discover Dark three track extravaganza. First up is the "Tech Mix", a full on stab driven tech trancer which breaks down to a suitably understated but effective trance riff before kicking back in with more full on heads down groove action. The Tech Dub mix continues down the same lines but eases up on the riff in the breakdown and finally the "Trance Mix" delivers as the title suggests. 'Passenger' is available now from Beatport and iTunes.